Amy You, a Laguna Beach High School senior and treasurer of the Art Club, had just finished her AP art portfolio on environmental issues when she and other students began to gather information about sea level rise. 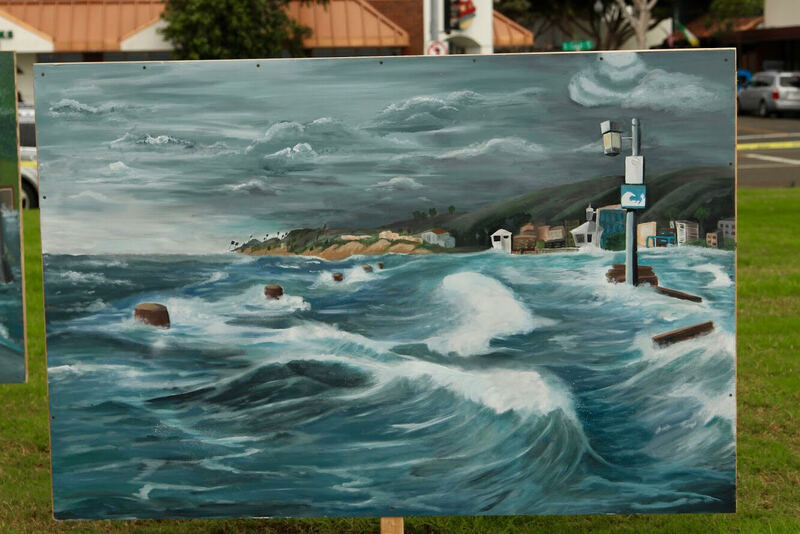 One of three student-painted murals depicting the fate of downtown Laguna Beach due to sea level rise installed last week at Main Beach. Photos by Bridget Beaudry-Porter. Students reviewed data from the California Coastal Commission on sea level rise, the 2017 United States Geological Survey, and Calmatters.org to see how an expanding coastline might impact Laguna and its landmarks. Mounted on posts in a grassy area by the Main Beach lifeguard tower, three 4’ x 6’ wood panel murals embodied the students’ dark vision of the future. They showed the sea at its worst: ravaging a waterfront home, covering Main Beach, and filling the streets near the downtown shops. Beaudry-Porter said her goal was for the dramatic scenes to heighten awareness and prompt discussion within the community. LBHS senior Joseph Ravenna scouted locations for the mural scenes. He suggested presenting a flooded downtown intersection as a symbol of the dangers that may face Laguna. “I hope the installation jars people into realizing the potential impact and how it could affect us if we don’t change,” Joseph said. The project showed him how political agendas can be woven effectively into art. As Joseph envisions future collegiate studies in political science, he said he likes knowing that visual, creative ideas can be used to shape opinions and help people. Over the past several months, Amy and Joseph were joined by dozens of LBHS art students during class periods, free periods, and afterschool. Beaudry-Porter said a total of 45 high schoolers participated in the murals, which were painted free hand and then coated to protect them from the elements. After receiving installation approval from the city, Beaudry-Porter mounted the three pieces during Art Walk on Thursday, Nov. 2, at Main Beach, where they remained through the weekend. They complemented the Laguna Art Museum’s Art & Nature symposium, which also was to feature an artwork symbolizing sea level rise. That work has yet to be installed due to unforeseen regulatory hurdles. 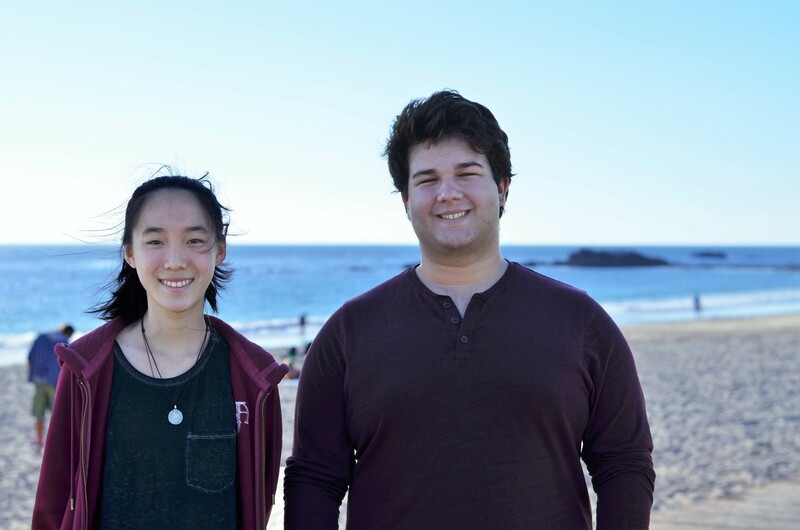 Seniors Amy You and Joseph Ravenna led the Sea Level Rise project. Zander, an interdisciplinary artist, said his work is “related to empty space and its connection to him.” He had two architectural pieces and one abstract piece on display and said he enjoyed sharing them. “It was really fun talking to the other artists at the Cove Gallery and meeting people who were attending Art Walk,” Zander said.